In the 10:0 win over Denmark, Canada’s goals were scored by six different players: captain Samuel Charron (three), Jamie Ackinclose (two), Lucas Bruno (two), Matthew Brown, Liam Stanley, and Nicholas Heffernan. Goalkeeper Damien Wojtiw posted a clean sheet over 50 minutes before he was replaced by debutant Sam Denton for the last 10 minutes of the match. From 13 nations in Denmark, eight will qualify for next year’s 16-nation IFCPF World Championships in Argentina (with eight nations previously qualified in 2015). In Denmark, the top-two nations from each group will qualify for Argentina 2017. 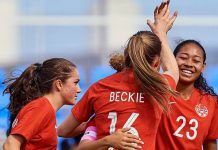 Canada’s next group matches are 30 July against Finland (18.00 local /12.00 ET / 09.00 PT) and 1 August against Japan (11.30 local / 05.30 ET /02.30 PT). The top two nations will then advance to the Quarterfinals on 3 August. The 30 July match at Field 1 will be broadcast live (CP Football Denmark 2016 on Youtube) while the third match at Field 2 will be broadcast on delay.